Diagnostic notes is an additional information about repair ticket. They are public notes and can be seen by technicians as well as customers. They are mentioned in invoice as well. You can add diagnostic note from POS while creating a repair ticket, or add them in an existing ticket. 1. 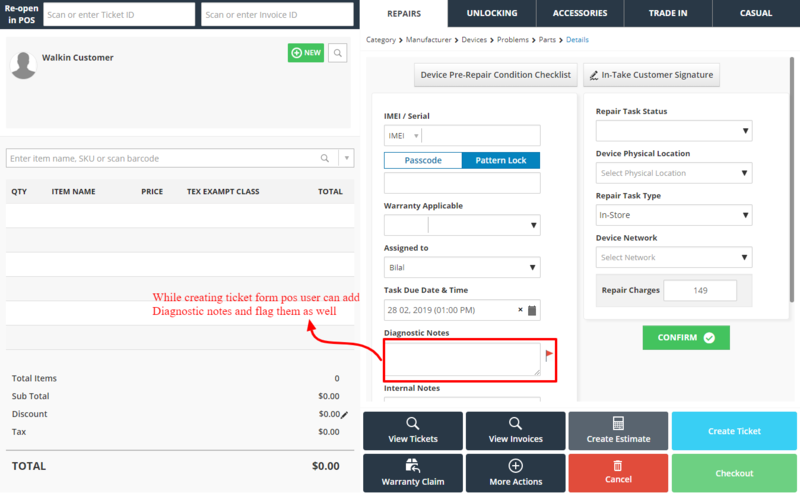 Proceed to create a ticket and on the Details page, enter Diagnostic Notes in its relevant text field. 2. Click on Confirm. Now when you will create a ticket, these notes will appear in ticket as well as invoice. 1.Go to Repairs >> Manage Tickets. 2. Open a ticket by selecting Action >> View Ticket. 3. At the bottom, under the Diagnostic Notes tab you can view all the public diagnostic comments. 4. If you want to add another one, simply write one in the text field and click on Save. These diagnostic notes will also appear in the description section on the invoice.